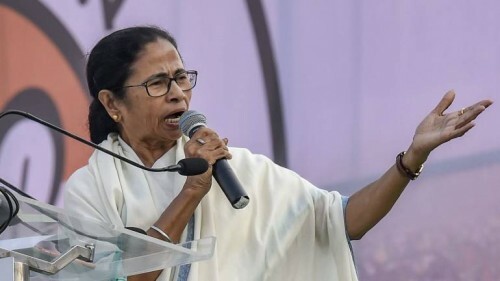 Kurseong (West Bengal), April 12 (IANS) West Bengal Chief Minister Mamata Banerjee said on Friday that she was proud of the country's armed forces but will never seek votes in the name of the army like Prime Minister Narendra Modi. Addressing a rally in Kurseong in north Bengal's Darjeeling hills, which witnessed massive statehood agitation in 2017, Banerjee said her government will take up "certain measures" to protect the identity of the Gorkha community after the Lok Sabha elections. "I am proud of the Gorkha regiment in the Indian Army. But I do not seek votes in the name of our soldiers during elections like Narendra Modi. Army is in the highest position. They are like the stars in the sky. Do not bring them down like this and insult them," Banerjee said. "I have seen that many former army chiefs have condemned the politicisation of the army like this. I support their point of view. Modi, Amit Shah or Ahluwalia will come and go, but the army who protect us and our nation will remain as an integral part of our lives," she said. "I know that you have certain demands about protecting your community's identity. It is a legitimate demand. We are Bengalis. We also have our own identity. So the Gorkhas should have recognition of their identity. There is nothing bad in it," the Trinamool Congress supremo said. "When the GTA (Gorkha Territorial Administration) agreement took place, my government was new. I did not get a chance to see the agreement before that. But later we discussed about it. After the elections, we will find a solution to protect the Gorkha identity and give the Gorkhas their deserved respect," she noted. Criticising the BJP for fielding Manipur's Raju Singh Bista as its Lok Sabha candidate from Darjeeing, Banerjee questioned why the party did not choose a local instead and pointed out that her party has fielded a local leader. "Did you not get a single eligible candidate from among the boys and girls in Darjeeling that you have brought in someone from Manipur? I haven't given a Bengali candidate. I have chosen a son of the soil," she said, urging the people to vote for Amar Singh Rai.